Made to measure laminate Vanity units for both semi recessed and countertop basins. Our laminate vanity units will complement and complete your washroom perfectly.We offer two different material options dependent on the application and performance required. Our HPL vanity units are manufactured using an 18mm moisture resistant core board, high pressure laminate is then applied and the front edge and rear upstand are postformed to create a luxurious single piece top with smooth lines. The square edges have a matching laminate applied using PU adhesive for added protection against moisture ingress. Our HPL vanity units are manufactured using an 18mm moisture resistant core board, high pressure laminate is then applied and the front edge and rear upstand are postformed to create a luxurious single piece top with smooth lines. The square edges have a matching laminate applied using PU adhesive for added protection against moisture ingress. 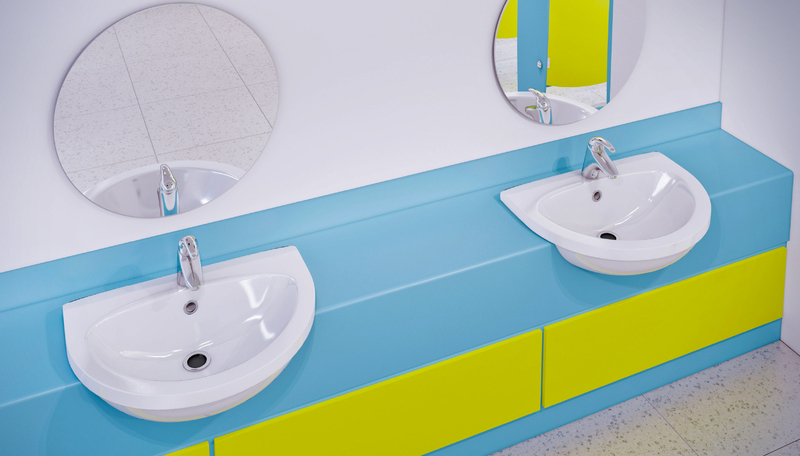 Our laminate vanity units will complement and complete your washroom perfectly.We offer two different material options dependent on the application and performance required.